And then all of a sudden after a few days back in Mindelo, we were about to cross the Atlantic. Heres a bit of a day by day account of our crossing. The morning after the rally’s farewell party, the somewhat seedy skipper and his still faithful crew set off on a 2000nm liver cleansing exercise across the Atlantic. The wind was fairly roaring down the channel as we clocked up 9s and 10s. Several boats got into difficulties in these few initial miles and we heard that Bill and Jade had to turn back with some rigging issues. They joined a few other boats in Mindelo who had a delayed start waiting for crew and/or parts. We pressed on past the bottom of San Anteo and immediately ran out of wind. On came the motors as we tried to clear the wind shadow that the tall volcanic mountains of San Anteo created. It ended up taking 3-4 hours, during which we had a few false starts, at one stage putting up Hotlips, our parasailor only to find the wind dropping and completely changing direction. We had to get it down hurriedly before we took out Oysterbar who were still travelling in the somewhat more correct direction of Barbados. We finally made it out of the wind shadow and got on a nice broad reach of 140 degrees on main and jib doing 6-7knots. We stayed like this all night throwing in the occasional gybe to keep on our course. We had set our course to a waypoint half way across on the same latitude as Barbados according to Jimmy’s advice. He likes us to get down there half to two thirds of the way across so we can duck down further if any tropical depressions rear their ugly head. 1859NM to go. 144NM closer than yesterday. Our broad reach was working well as the wind steadily increased towards the magic 20kts apparent, where we would have to reef. The swell was building past 2m and the sailing was exhilarating as we often cracked 12kts surfing down the waves. This made fishing difficult and the one Dorado we hooked jumped off as we were going too fast. Mid morning, we decided to put in the first reef and try to slow down the boat a bit. The apparent wind built to mid-twenties as we screamed down waves at 12kts sometimes. By mid-afternoon we put in the second reef as the true wind was topping 30kts and the swell was over 3m with a couple of monsters over 4m thrown in to make it interesting. We were sailing close to Stormbreaker and broke up the day chatting on VHF. They told us about Maggie Drum who were passed by a cruise liner, who somewhat mysteriously turned around and came back straight at them. Somewhat alarmed, Maggie Drum got on the VHF and asked if they where about to be run down. The Cruise Ship then told them that a passenger on deck thought Maggie Drum was in distress and tried to get them on the VHF. After no reply, he turned his cruise liner around so he could give assistance. With no-one in distress, all parties adjusted their course and went on their merry ways. That night Phil managed to surf down a set of three monsters and hit 15kts of boat speed. This was not what we signed up for but at least on a cat we were comfortable to the point we were able to BBQ on the back of La Mischief, albeit hanging on with one hand whilst flipping the meat with the other. Well at least we thought we were comfortable until Phil went into his room and found a flood of salt water coming in. We thought it was the stanchion initially but we eventually worked out that the seam between the deck and the hulls was leaking. And quite badly. Maybe it was from the pounding we had at Fogo, although we had three large fenders protecting that part of the boat – who knows. Whatever it was Lagoon will be getting a warranty call. Hulls aren’t supposed to leak. Luckily we had a plumber on board. We had Sten hanging over the side in a big swell with a tube of sikaflex filling in the holes under the rub rail where the water was coming in. He did a great job keeping most of the water out and the next morning we got a mirror down there and filled in the remaining gaps. 1694NM to go. 165NM closer than yesterday. Friday saw the swell dropping a little bit but we were still barreling along at 8kts under 2 reefs. We set about drying out Phil’s room and washing all the salt out of his bedding. The sikiflex patch-up job seems to be working. We talked to Stormbreaker on the VHF as they were close by and found out that they had a much worse night than us, getting constantly soaked and having gybed twice as a giant wave spun the back of their boat, breaking their gooseneck and two preventers. Ouch. So now they get to sail across the Atlantic without a mainsail, relying instead on their Pacific Booster. Hopefully they will be okay. We were also a little concerned about Lady Rebel who had broken a traveller and had a rumbling noise coming from their welded in dagger board. It was good to hear later that all was good. 1548NM to go. 146NM closer than yesterday. Saturday began with the wind and swell dropping off enough to pull the two reefs out and run with a full main until everyone got up and had breakfast, before we put up Hotlips. You can tell we are not racing as sleep, breakfast and coffee came first. With the parasailor up, the boat sat a lot better and the autopilots workload decreased significantly. What a great sail Hotlips is. We were doing 8-9-10s in 10-15 apparent and loving it. With Hotlips up and flying we went on chaffing patrol and covered up anything that could chaff a line. It did make fishing a bit more difficult at that speed. Luckily we managed to snare a small-medium trevally type fish of the genus “got no idea”. Nothing like it seen in Australian waters but it tasted good and we are all still alive after it fed all five of us. Another day, another boat problem. This time with the Raymarine chart plotters. Suddenly the chart plotter at the helm couldn’t talk to the chart plotter at the nav station. To get around this problem we made both chart plotters their own master. This seemed to work for a while until the Radar got confused and refused to power up. Bummer, the radar is sort of very handy when we have the parasailor up at night and there are squalls about. Late in the day we passed by Xada and suspected we might not see another B50 boat on AIS for quite a while. Its a big ocean out here. Besides the radar problem, the night sail was quite magical. We left the parasailor up under the moon light and cruised along at 6s and 7s. The radar made a couple of brief appearances but generally it was in the naughty corner. 1384NM to go. 164NM closer than yesterday. The wind continued to drop out and we were doing 6s and 7s in 6-10kts of apparent. We were passing our days reading, fixing things and organising the boat. Sten’s cooking prowess was on display making all sorts of culinary creations. Dee spent the day going through all the various manuals filing them away in order. We looked forward to downloading the boat positions to see where everyone was. We also downloaded weather a couple of times a day and the forecasts are starting to look good – touch wood. We’ve discovered a leak behind the water maker and also have freshwater leaking into the starboard bilge from somewhere unknown. Our resident plumber was onto both jobs today. We were still trying to get the radar to go – we found some corrosion in a SeaTalk box whose cover was left off by some workman in Croatia, letting some water come in when the front windows were left open as the main sail went up after a storm from Brava. Phil meanwhile was trying everything (short of throwing the bananas overboard) to catch a fish for dinner. Lines were lengthened, lures were interchanged, teasers were deployed – all to no avail. 1225NM to go. 159NM closer than yesterday. Our second beautiful night of parasailing as we head down towards the latitude of Barbados. The Radar is making the odd appearance staying on for up to an hour before disappearing once again. The moon is going to be the closest to Earth since 1948 tonight (next one will be in 2034) so we will have good visibility from the supermoon and should be able to spot any potential squalls by just looking. The wind dropped off for most of the day and our speed was down to 5s and 6s. The sun came out and it was a very pleasant day cruising along with just the Parasailor up. Our lackadaisical day was broken mid afternoon when not one but three fish jumps on our lines all at once. The Mahi mahi that took our middle line with the teaser on it managed to jump off, but we managed to get the other two on board – one on each hull. The back deck of La Mischief resembled a fish factory as Phil went to town filleting both fish. He was a happy camper after a couple of days of inactivity in the fishing department. We had a great feed of fish – identity unknown – nice red meat. We left the Mahi Mahi for later. 1077NM to go.. 148NM closer than yesterday. We got a bit of wind in the morning and cranked her up to 7+ knots. 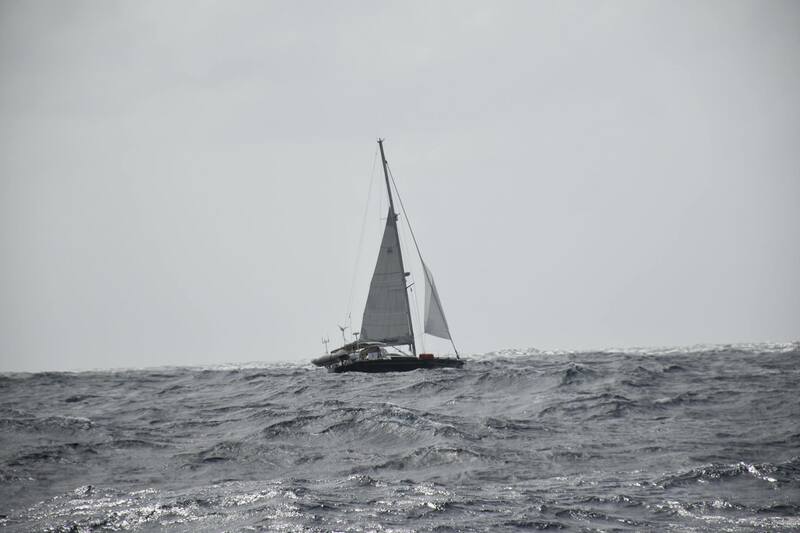 We were 20 miles north of Barbados latitude so we decided to change course directly to Barbados whilst ensuring that we gradually slipped South the 20nm required to bring us in line with Barbados. But by the afternoon the wind had dropped out and we were only doing 5s and the occasional 6. It was a beautiful sunny day and we were all looking forward to crossing the half way point later that night. The speed seemed to be good for fishing as we got multiple hits on all the lines as we went through a couple of schools of Bonitos. Dee and Phil weren’t keen on Bonitos so back they went to live another day. Night time came and we got back our radar. Seems to be working now we turned off and unplugged the Raymarine wireless Smartcontroller. Heres hoping as we got a little bit of rain but the radar showed no squalls and Hotlips stayed up for the third night in a row. The wind picked up a bit and we managed to get into the 7s as we head directly to Barbados. 935NM to go. 142NM closer than yesterday. Now well over half way there. The wind continued to drop out and we were down to 5s and 6s. But the weather was nice and the seas slight and we were enjoying the journey, not worrying too much about the destination. We celebrated going past our half way point by BBQing up some Calamari and downing it with a glass of Spanish Cava each. First and last drink on our crossing. Mid afternoon seems to be the time to catch fish and this time it was Wahoo Wednesday. Phil was very excited (as we all were) to finally catch one. With jacket potatoes and broccoli we are well that night. After 4 days and 3 nights we decided to take down the parasailor as there were ominous looking clouds about. Good thing to as we had to avoid a few squalls that night. As they passed we got a bit of wind to sail with before it dropped out again and we motor sailed most of the night. 811NM to go. 124NM closer than yesterday. We got the parasailor up again and spent the day dodging squalls. Our radar was working again (for the moment) so we were able to see them come up behind us and usually cross from North to South. First the wind was light then as a squall approached it picked up and gave us a kick, but usually had us tracking south. We weren’t making much VMG and we were now south of Barbados’ latitude. Meanwhile we were sailing through lots of sargasso weed and the water was a horrible green colour. Not much good for fishing either with all the weed about. With a couple of hours of daylight to go, the last of the squalls passed us and we kept our speed up as the angle straightened and our VMG improved. We had tried a barber haul with Hotlines and this allowed us to sail at 140 degrees to the wind, an extra 15 degrees, so we were pleased with this. We pulled the parasailor down at dusk and managed to go along at 7 knots using the white sails. With the wind with some north in it we had a beautiful reach through the night and made up some of the ground we lost during the day. 671NM to go. 140NM closer than yesterday. Another good day with the parasailor up all day and all night. Another two fish added to the ever filling freezer – a small Trivially and a medium sized Mahi Mahi. It was proving a little difficult to get the bigger fish on board when doing 7kts under spinnaker. Phil would disappear down the back steps in his lifejacket and harness and gaff them on board. As well as the two we landed , we hooked a monster but after about 5 minutes he throw the line. As Andrea and Ian noted in their book “Letters from the Caribbean” , we are also one Sydney to Hobart away from the finish. With the wind from the North East we needed to deploy the barber haul to go due west. At one stage Sten had La Mischief sailing along with a wind angle of 127 – not bad for a parasailor. Generally we kept it at 140 as its really quite comfortable there. 530NM to go. 141NM closer than yesterday. In the morning, the water colour is back to a wonderful blue colour after a couple of days of weedy green. It doesn’t last and by the afternoon its back to a weedy green colour. Its Saturday night so we decide to leave the parasailor up for a second night. We are making some miles in good time now and we start to think about getting to Barbados on Tuesday rather than our previous guesstimate of Wednesday. 367NM to go. 163NM closer than yesterday. I’m up early as I feel the boat accelerate. Looking out the back we see a rain squall approaching. We let the parasailor fly higher and we accelerate to 12kts in 19kt of apparent wind. With Hotlips up on top, La Mischief seems to like it a lot. We end up having a pretty good 24hours when the position report comes in on email at 1200GMT. We are running forth in the fleet, ahead of a 50 foot Catana and some other multihulls. We are behind a larger Outremer, a 45 foot Neel Tri and a 53 foot Halberg Rasy that has been motoring for 4 of the days. But its not a race! Of course! Thats pretty good considering that we’ve been in light winds -10-15kts – for a lot of the time. Dee really wanted to get in with enough time to prepare for thanksgiving and it looked like we should be able to do it if we maintained our current pace. We had one reef in the main so squalls shouldn’t worry us and we could even get a lift from them. 217NM to go. 150NM closer than yesterday. After a night where Sten had fun dodging Squalls on the Radar using all the skills from his teenage years playing Space Invaders, we managed to speed up in the morning going Wing on wing with the full main up now up. We went through a couple of squalls but the apparent wind never made it over 16kts. In the afternoon the wind died off but we made the mistake of not putting up the parasailor. We were still going okay though and we thought we could make Barbados the next afternoon. Then as we crept up behind a squall line the wind completely dropped out and we turned on the motors to do the 6.5kts we needed to accomplish our finishing time. We were still doing okay at 8pm but by midnight we had dropped well below our required pace and the maths no longer added up. So off went the motors and we went wing on wing doing 4s and 5s for the rest of the night. 80NM to go. 137NM closer than yesterday. A couple of hours behind schedule. As day came we put up the parasailor and off we went at 5s and 6s. We weren’t going to make it in daylight so we contacted Rally Control to see what our options were for coming in at night – something that Jimmy had counselled against. They told us customs went home at 8pm so on went the motors. This was a touch disappointing as I really wanted to sail into Barbados. Before last night we had only done 15 hours of motoring and now we would be motoring for most of the day when we could be pleasantly sailing along at 6kts. Them’s the breaks I suppose. For a while we had the parasailor up and with the motor on we were doing 7s and 8s. The squalls gave us 20kts of wind and plenty of rain and we loved the fact that it pushed our speed up to 9s and 10s. Then the squalls went and the wind died to nothing. Down came Hotlips for the last time this crossing and on came the motors. We burnt off a bit of carbon as we motored at 8kts to get in around 6.30pm. About 2,45pm we spotted a fishing boat and off to the right LAND. We were nearly there – 20nm off the coast. Four hours later we were parked outside the harbour in the dark waiting for 2 cruise boats to leave. We made it to the shallow draught harbour just after 7 and there were Jimmy and Pascal waiting to greet us and help us with the formalities with Customs and Immigration. This entry was posted in Atlantic Crossing by stull61. Bookmark the permalink. Congratulations and a good read as well. Remember whatever the question Rum is always a possible answer. I would possibly go more specific and say “Mt Gay” Rum is the answer. Looking forward to the distillery tour. You should be a writer!!! Congratulations on a safe journey! Hope you started drinking again!! You guys deserve it!! What a great adventure!! thanks Steve. …off on a tour of Mt gay distillery on Monday. coming back to WA next month. own in bunker bay with folks from 21st to 26th. will try and pop up and see you guys then.